Happy Wednesday! Because you are all incredibly awesome and I can’t tell you enough how much I appreciate each one of you, I’ve teamed up with a few of my favorite blogging friends to host a reader appreciation giveaway! 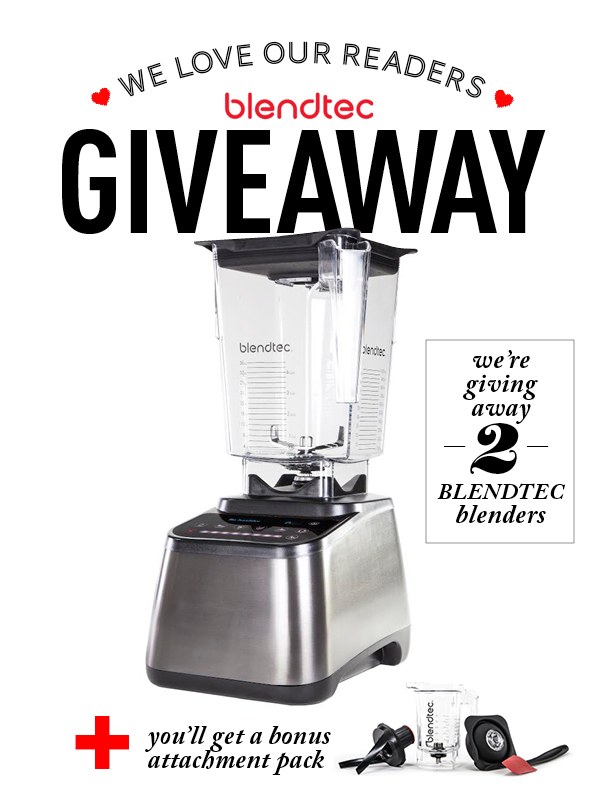 And not just any little giveaway – a Blendtec giveaway. I got my Blendtec back in the Spring and it’s changed the way I eat and cook. It holds a permanent place on our counter and gets used daily for smoothies, soups and even grinding coffee beans – oh, yes. This giveaway will have two winners – yes, two! One winner will win the Blendtec Designer 625 + Twister Jar (RV $599.94) and another winner will win the Blendtec Designer 725 + Twister Jar (RV $769.90). ELIGIBILITY + RULES : Open to USA residents, 18 years of age and older. This giveaway is sponsored by Blendtec and is in no way affiliated with Facebook or Instagram. Giveaway ends on November 5th, at 11:59 p.m EDT. Winner will be emailed on or about November 6th, and will have 48 hours to claim the prize. If prize is not claimed, an alternate winner will be selected. Use the widget below to enter for your chance to win one of these two unbelievable Blendtec Blenders! This giveaway is being sponsored by Blendtec. It is not affiliated with Facebook or Instagram. Thank you all for taking the time to stop by Jelly Toast and enjoy the food, photos and words. I can’t begin to tell you how much I appreciate all of you. Awesome giveaway! I’ve heard such great things about Blendtec and I appreciate the opportunity to enter. We’re so happy to be able to offer it to all of our readers! Thanks for stopping by and entering!! Oh wow, the Blendtec is the best. In Nov. we will be at the 3 year mark for owning one of these bad boys. Use it every day and wouldn’t trade it for anything. I agree that it is a major appliance in the kitchen today. Thanks for offering 2 to be given away. Truly awesome!!! I couldn’t agree more, Susan! I’m so happy to have the chance to offer the giveaway along with some more of my blogging friends. Thanks so much for stopping by! !